After owning the ARB Flat Alloy Roof Rack for over two months now I thought it would be good to write a follow-up article. Essentially, I want to give you any knowledge I can on this roof rack – what I like, what could be improved and what you could potentially use this rack for. There are a lot of different aftermarket roof racks on the market, so I think it is crucial to provide thorough discussion on the ARB Flat Alloy Roof Rack. Let’s get started! 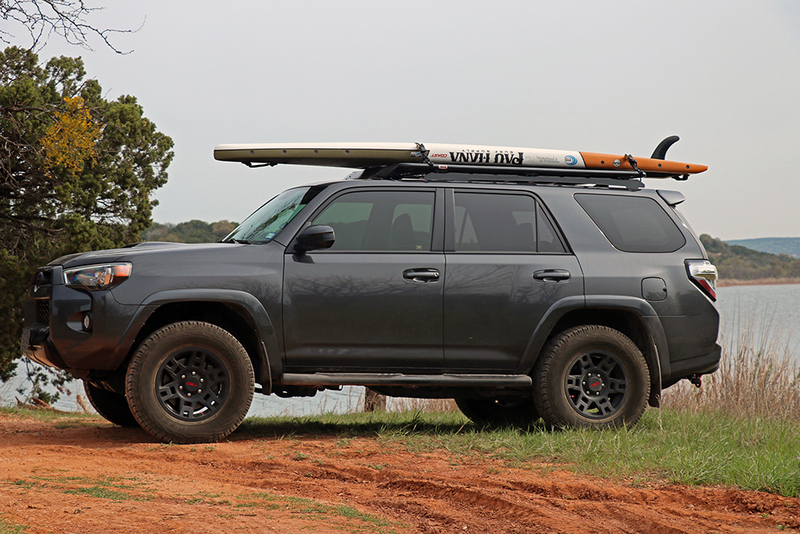 The first thing I want to mention is that I think this roof rack adds a really nice visual appeal to my 4Runner…and apparently, a lot of other people do as well as I get asked about it quite often. Sometimes I initially install something and think it looks great, but over time I realize I like something else a little better. This is not the case with the ARB Flat Alloy Roof Rack. I like the way this rack looks so much. This is something that does have a personal bias, but like I mentioned, quite a bit of people also seem to like this roof rack from the comments I have received in person. Although this rack is very lightweight and low profile you need to expect a loss in fuel economy…like with any other roof rack out there. Does this roof rack have better or worse fuel economy than other racks on the market? I can’t say, as I only have firsthand experience with the ARB roof rack. 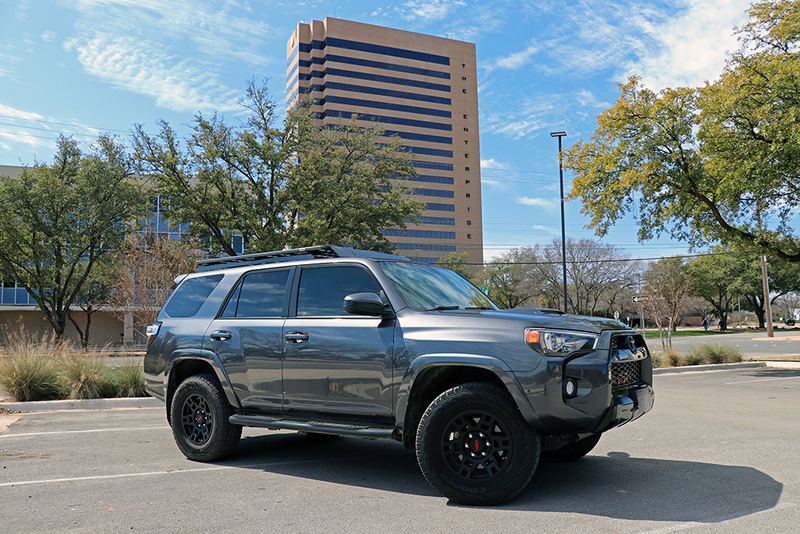 For my particular 4Runner setup and driving style I was averaging 18.3 MPG (factory roof rack and cargo bars installed) prior to installing the ARB Flat Alloy Roof Rack and 17.7 MPG after installation. I completed over 2,500 miles of testing so I’d imagine a 0.4 to 0.8 drop in MPG should be expected depending on your 4Runner’s setup and your individual driving style. I do have a solution for this though, so keep reading. Somewhat correlated to the reduction in fuel economy, this roof rack does produce some wind noise at highway speed. Is it terrible? No, but there is an increase of wind noise. I think some people might not mind it at all while others may want to fix it. When I was researching roof racks it seemed evident that lots of aftermarket roof racks produce additional wind noise so the ARB roof rack isn’t any different. Luckily, I have a solution for both wind noise and fuel economy. I think this roof rack is very useful and can be suited for a wide variety of purposes. 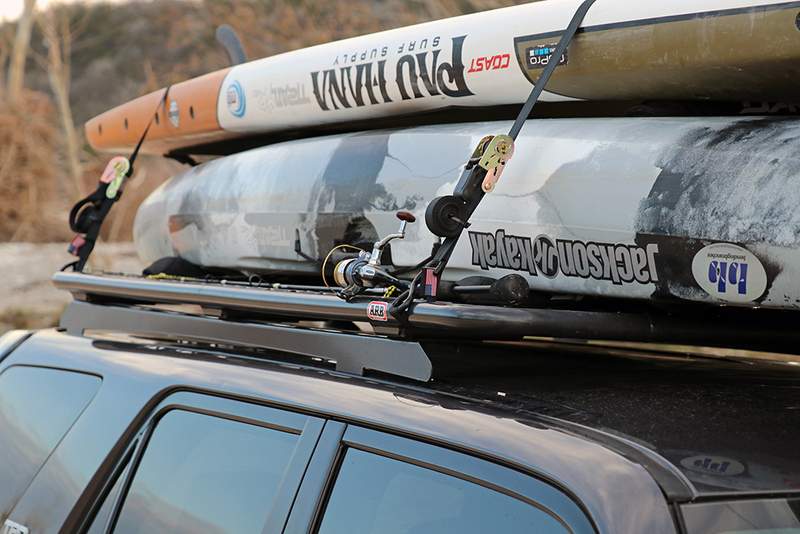 This is one of the great qualities of the ARB Flat Alloy Roof Rack – the customizable platform you can work from. For my particular needs, I use the rack primarily for transporting my kayaks and paddleboards. It works really good at providing a nice stable platform. Since this roof rack is much longer than the factory cargo bars, I don’t have any issues with my kayaks or paddleboards touching the roof (something I had an issue with while utilizing factory cargo bars). The longer roof rack provides a much more stable and sturdier base too. What I have found interesting about installing this roof rack is the number of things you can use it for that you wouldn’t have thought about if you didn’t have the roof rack installed. What type of things am I talking about? Well, I recently had to transport a new mattress to my house. Typically, I would use a truck for this…not anymore. I used my flat alloy rack and some Rhino ratchet straps and I was good to go. I can also transport lumber on top of my rack as well – something that I used to do with a truck or with boards sticking out my back window and laying on my seats; not something I like to do. Now I can put the boards on my roof rack and don’t have to worry about them rubbing my seats or moving around. I have typically put fishing poles in my vehicle too, but they are 7-feet long and the tips of my rods lay on the center console – a similar problem to hauling some 2 x 4’s. Now, I just bungee cord my fishing poles to my ARB roof rack and travel to my fishing destination. Although I don’t have any sort of rooftop tent, this rack would work great and I plan on getting one soon. 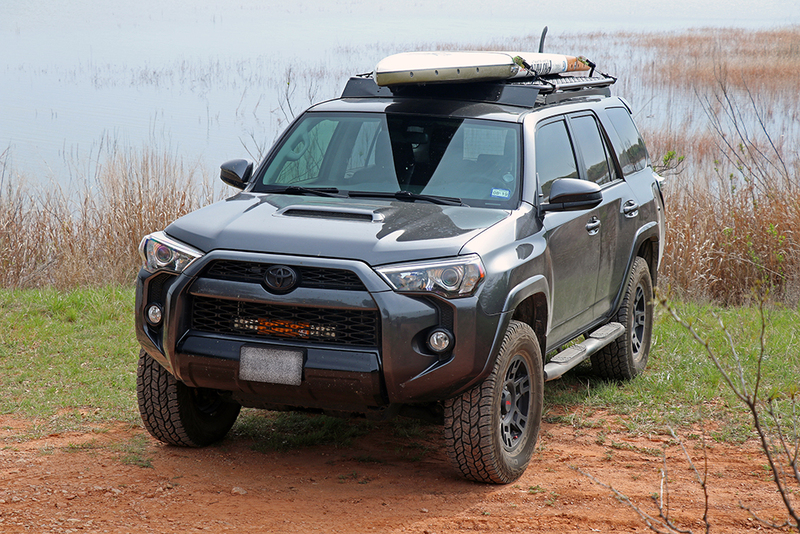 The platform this ARB roof rack provides is excellent for mounting a tent and I think a lot of people who are looking for a solution to mounting a rooftop tent on their 4Runner should consider this roof rack. What other things could you use this rack for? Maxtraxx, high lift jacks, a shooting platform, photography platform and a spot to mount external lights to name a few. I have found that the versatility of this rack to be excellent, as it is simple, but provides you with a great, low-profile platform to work from and customize to suit your individual needs and style. What Have I Done to the Roof Rack? One of my only complaints with this roof rack is that it doesn’t come with a wind deflector…but it does produce some wind and decreases fuel economy. I am not sure why ARB doesn’t produce a wind deflector for their flat alloy rack, but they don’t so what can you do? One option, which I originally looked into was purchasing a $150 wind deflector from Gobi. 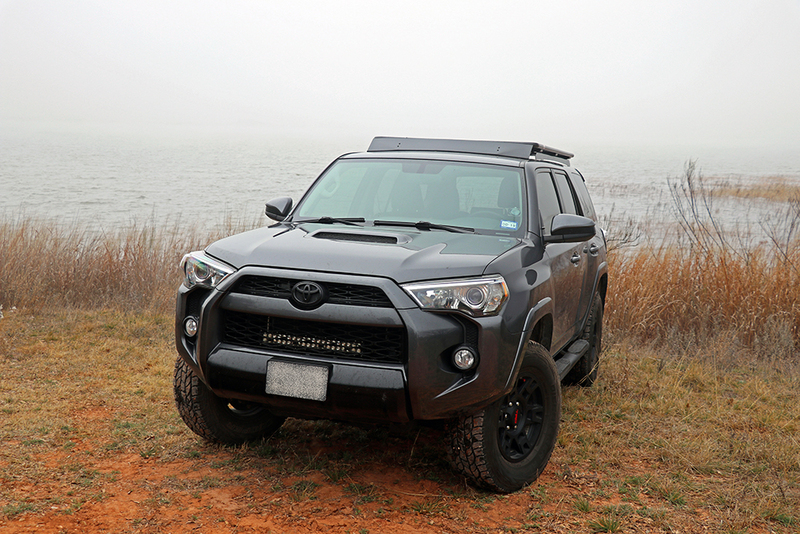 I have heard horror stories about lead times with Gobi, shipping, etc…and I also didn’t want to spend $150 for a wind deflector I’d still have to fabricate to work with my ARB rack. Being an engineer, I decided to see if I could make my ARB roof rack a little more efficient by designing my own wind deflector. I shaped the piece of aluminum for the wind deflector as best as I could to fit the profile (or the curvature) of my 4Runner’s roof, bent brackets to mount the wind deflector, painted the brackets and wind deflector and then adhered a piece of rubber to the bottom of the wind deflector so it wouldn’t scratch the roof. I know this is pretty quick and vague, but unfortunately, fabrication work sometimes isn’t super detailed, it is more of an art. So how well does my custom wind deflector work? I will admit, I didn’t think the wind deflector would increase my fuel economy by much. However, after 2,200 miles of testing I have improved my fuel economy from 17.7 MPG (without wind deflector) to 18.3 MPG (with wind deflector). What!?!? Yes, I know this sounds crazy, but the wind deflector made a tremendous difference and increased my fuel economy by 0.6 MPG. Wind noise has been drastically reduced, and of course my fuel economy has been improved as well. Unfortunately, ARB does not produce a wind deflector for this roof rack, and I can’t say if they are working on one for the future. I can say the wind deflector I made has worked unbelievably well and has been a great addition to my ARB Flat Alloy Roof Rack. What Will I Add in The Future? One item I am looking at is a ladder that goes on the rear lift gate so that you can climb onto the roof rack. I don’t think the ladder is as necessary as the wind deflector, but I would like to get on my roof rack to shoot from and take some photos. There are some options out there for a ladder, such as Gobi and C4 Fabrication. I am planning to install a C4 Fabrication Summit Ladder soon and I will provide a write up on how that works with the ARB Flat Alloy Roof Rack. 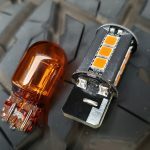 Although I have quite a few lighting upgrades on my 4Runner you can never have enough. Some of the lights I might mount to the ARB roof rack would be ditch lights, side scene lighting and reverse lighting. I do not know if I will utilize my future C4 Fabrication ladder or ARB roof rack, but one day I am going to get some recovery boards and I will mount them to either my roof rack or future C4 ladder. I am undecided on which option would be best, but I think the roof rack would be a great location. Is the Flat Rack Design Good or Bad? There are two primary styles of roof racks on the market – flat and basket. This ARB roof rack is flat of course, but other popular options such as Gobi are basket style. Here is my opinion. I think a flat rack works best if you use your 4Runner as a daily driver and want minimal wind noise and loss in fuel economy. 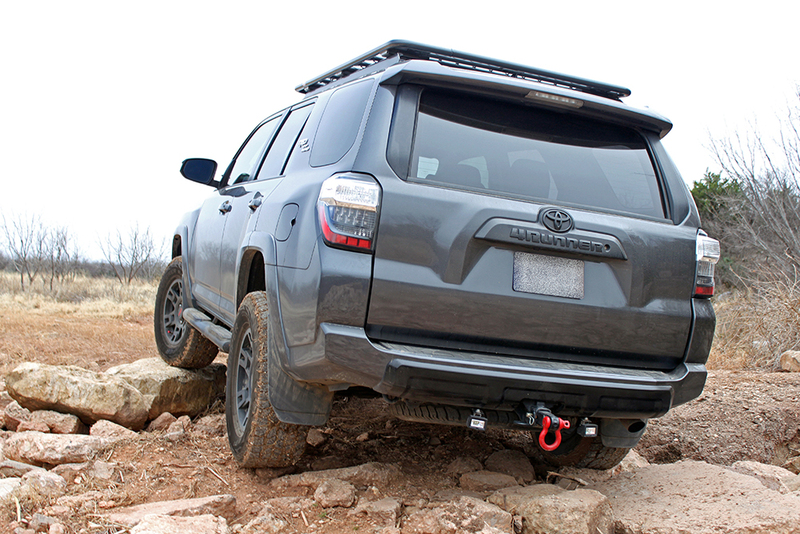 Basket racks may be better if you are constantly using your 4Runner for overlanding or expeditions…but not many people do this and you will have additional wind noise, loss in fuel economy, weight and bulkiness from a basket style rack. Another aspect that I really appreciate about the ARB flat rack design is the low profile. I park my 4Runner in a garage and I don’t have much room to spare. 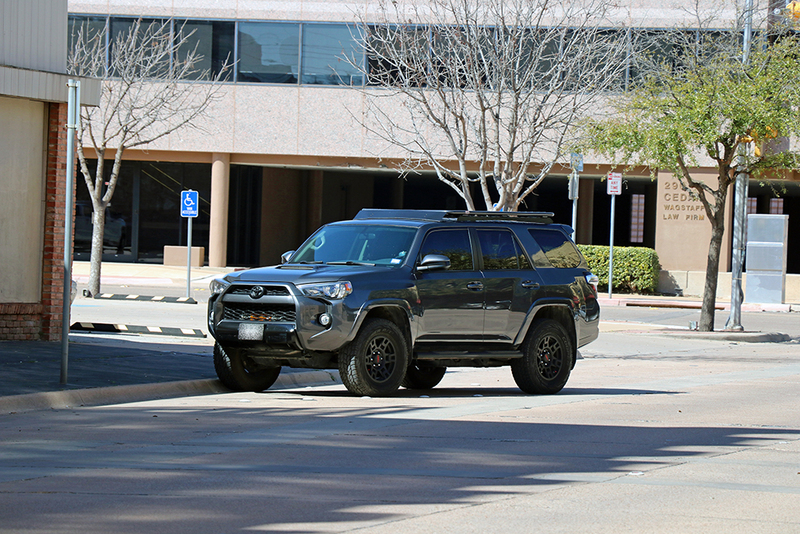 If you also park your 4Runner in a garage or parking garage, make sure to take into consideration the additional height an aftermarket roof rack can provide. Luckily, the ARB Flat Alloy Roof Rack doesn’t provide much additional height. All this said, I prefer the flat rack design. I wanted something that was sleek, lightweight, low profile, fuel efficient and customizable to my personal needs. The ARB Flat Alloy Roof Rack provides just this. Overall, this roof rack from ARB is amazing! It is low profile, lightweight and sturdy. I wish ARB made a wind deflector that pairs with the roof rack in order to provide reduced wind noise and increased fuel economy, however this isn’t a determining factor in my opinion. I believe this roof rack is amongst the elite options on the market today. One of the biggest selling points to me is it is made from aluminum…much lighter and corrosion resistant than steel. You never want to add a lot of weight at the highest point on your vehicle. Without hesitation I would recommend this roof rack to others for the quality, strength, appearance, reasonable cost and versatility that the ARB Flat Alloy Roof Rack provides. Clint, thanks for very nice article. 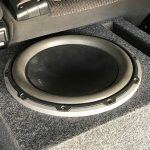 Very helpful for my decision about rack for new 4Runner. Steve, I’m glad it helped out! Zack, the rack is the 70” x 44” flat alloy roof rack. Because of your review on this roof rack, we ordered one about a month ago. We’re getting it installed this Thursday! You say you haven’t gotten a rooftop tent — you certainly should soon. We use ours all the time. It’s mounted on our Tacoma. Once we get the roof rack installed, we’ll be using it on my 4Runner. Leslie, that’s awesome, I think you will be very happy when you get it installed! I do need to get a rooftop tent, any recommendations? Here’s the thing. We just got a call from 4Wheel Parts. ARB sent the wrong roof rack. We had ordered the flat mesh one but they sent one that is flat but no mesh, just crossbars. We’ve decided to go ahead and have this one installed since we’ve been waiting a couple of months. Sabrina at 4Wheel Parts said the mesh one might not be the best rack for a tent. Something about the mesh shape being welded at each diamond on the cross bars and not being adjustable. I’ll report back once we pick it up tonight. Leslie, sorry to hear you got a different rack than you ordered. The mesh is welded to the cross bars and is not adjustable – so depending on your particular setup that may be a pro or a con. Thank you for the information on the tent, I’ll have to look further into this!